Compared to previous years, perhaps 2016 wasn’t quite as spectacular when it came to new buildings. However, it doesn’t mean it was any less interesting. Some of these investments were long-awaited, others likely to change the quality of life in their city, while some turned out to be controversial. A lot has happened – Polish architects received international awards, and we started discussing subjects that were ignored before. Here is an overview of the architecture events of the passing year. In 2015, when the white, slender edifice of the Szczecin Philharmonic was announced as best building in the European Union, the neighbouring Dialogue Centre Upheavals was still being built. Back then, we already knew that the museum designed by Robert Konieczny and KWK Promes would be special, especially since it was announced it would be hidden underground. But nobody predicted that yet another outstanding building would arise here. Robert Konieczny’s idea to create an original public space – instead of erecting another building near the iconic Philharmonic – was appreciated not only by users, but also the international body. The Dialogue Centre Upheavals was placed into service in 2016 and received two prestigious international awards: it was announced the best urban public space in Europe (the Prize for Urban Public Space competition) and soon after that, during the Berlin World Architecture Festival, it was awarded the title World Building of the Year. Yes, the best building in the world. Thanks to these two outstanding architectural creations, West Pomerania’s capital has become an important place on the world’s architecture map. 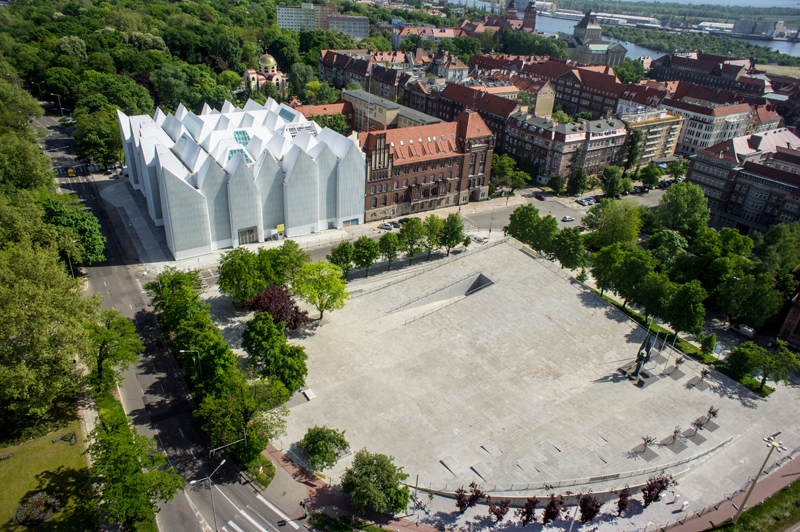 Put simply, if you want to see the best examples of contemporary architecture – go to Szczecin! For years, city-wide architectural awards have been given by the local authorities of Poznań, Wrocław, Kraków, Kielce, as well as cities in Silesia and Pomerania. These kind of local competitions are key to stimulating discussion about architecture, encouraging inhabitants to look around and evaluate the surrounding buildings. They also build feelings of local pride, what with our immediate surroundings being the most important to us, inevitably leading us to care about its quality. In 2016, after many years, the Architectural Prize of the Mayor of Warsaw was reactivated, and the capital joined the group of the cities where new architectural enterprises are being judged and appreciated. When they went to vote, Varsovians didn’t award the most spectacular investment but rather an important one for city life – the renovation and modernisation of the Warsaw Public Library, where many generations of the city’s inhabitants had spent time broadening their knowledge. The Grand Prix awarded by the jury aroused even more emotions though. The award didn’t go to any building but an exhibition. It was given to the noteworthy annual Warsaw Under Construction festival organised by the Museum of Modern Art in Warsaw, specifically its 2015 edition which centred around the exhibition Reconstruction Disputes. The show was dedicated to the phenomenon of the capital’s post-war reconstruction and its contemporary consequences – the reprivatisation of Warsaw’s buildings and land. Some architects decided that awarding a cultural event was misappropriating the idea of the competition, which was supposed to judge buildings. Others noticed that the award was given by the authorities of Warsaw soon after a series of publications criticising certain less-than profitable actions by City Hall to do with reprivatisation. Despite the differing opinions, the results of the Architectural Prize of the Mayor of Warsaw prove that architecture is not only about pretty buildings and when discussing the space that surrounds us, we shouldn’t limit our thoughts only to them. The citizens of Łódź have been waiting for this opening for a long time. Autumn 2011 was the last time a train departed the Łódź Fabryczna railway station in the city centre, and a few months later there was nothing of the building left. Construction of the new station began, a place that was supposed to be a hub connecting many different means of transportation. 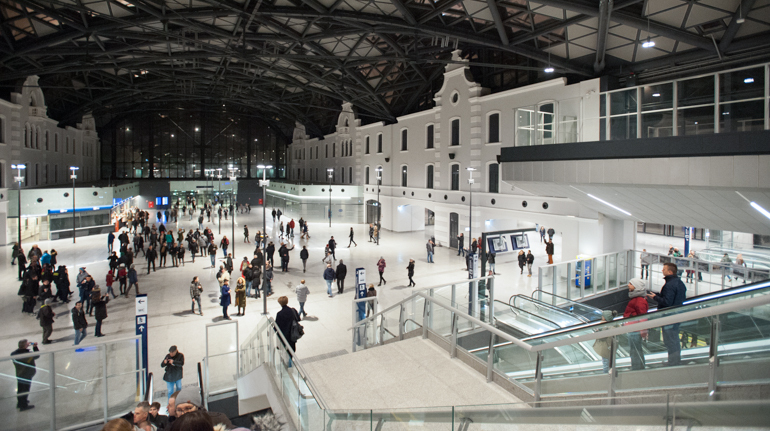 A distinctive symbol of the previous incarnation appeared when the main hall of the new station opened in December 2016: its expressive glass roof, decorated with mock facades of the apartments that used to be part of the old building. Łódź’s new train station is another investment aimed at improving the quality of life of citizens and increase a city’s attractiveness in the eyes of investors. Łódź had dealt for many years with the problem of a decreasing population – it has one of the fastest shrinking populations in Poland. A neglected city needs huge investments – it needs new workplaces, as well as renovations in housing or even the revitalisation of whole neighbourhoods. Łódź’s local authority wanted to increase its attractiveness through the phenomenon of architecture. Different things were attempted and huge visions were created: a new centre was supposed to be designed by Rob Krier, a huge festival centre was sketched by Frank Gehry, and the build-up of spectacular buildings was supposed to take place in participation with David Lynch and Daniel Libeskind. Although those plans didn’t come to fruition, others did. A few years ago, the former power plant neighbouring the old station was transformed into a centre for culture and science, and now this modern transport hub has arisen in the heart of the city. Will this huge new investment give a new life to the city? We will soon find out. So far, despite praise for the building, the surroundings of the train station with roads with two or more lanes and grade separated crossings and without friendly public spaces were strongly criticised. A large cultural centre for Lublin was supposed to be built near one of the main streets at the end of the 1960s, specifically an ultramodern theatre. Although construction of the building began, it was never finished. The Theatre Under Construction, as it was called, was a blemish on Lublin’s the city centre for almost four decades. In 2009, a contest was held for a new building design that would take the place of the unfinished theatre. A famous architect from Lublin, Bolesław Stelmach, won the competition with his strict construction of concrete and glass. In summer 2016, the new Centre for the Meeting of Cultures in Lublin opened its doors. The building includes a big concert hall and theatre, and many smaller rooms available for lectures, shows, concerts, workshops, meetings and exhibitions. However that’s not all: the square in front of the building has been given over to the people. The concrete slopes supporting the construction are designed for bikers and skateboarders, while the building’s huge glass facade was designed as a screen for film projections and light shows. Essentially, it is a cultural centre in the modern sense. Although it has many traditional rooms like a theatre, most of its space was designed to enable using it in many different ways. Its flexible, easy-to-arrange space allows different kinds of activities that make it attractive to different groups of users. Its faded, elegant and minimal architecture designed by Bolesław Stelmach is a wonderful background for them all. The Polish press loves to write about international successes especially when Poles win important, well-known and prestigious competitions. The rule is prevails everywhere, from sport to architecture. However it’s not often possible to hear about the successes of young people making their debut and being noticed internationally at the beginning of their careers. But 2016 was a year full of young Polish architects’ successes. The Venice Architecture Biennale opened in May, where Hugon Kowalski was personally invited to participate by the curator, a Pitzker Award laureate, Alejandro Aravena. This was a huge success a designer under thirty years-old. In Venice, Kowalski and his team presented the installation Let’s Talk about Garbage which highlighted the problem of the over-production of trash and ways of solving it with architecture’s help. In 2016 a new competition searching for the most promising talents was announced by the same foundation that every two years grants the most prestigious architecture award in Europe: the Mies van der Rohe Award. The Young talent Architecture Award is supposed to recognise those who one day may build the best European buildings during their future professional career. In the first edition of the competition, two of three main prizes were given to Polish architecture students: Iwo Borkowicz, a graduate at the Catholic University of Leuven in Belgium, and Tomasz Broma from the Wrocław University of Science and Technology. 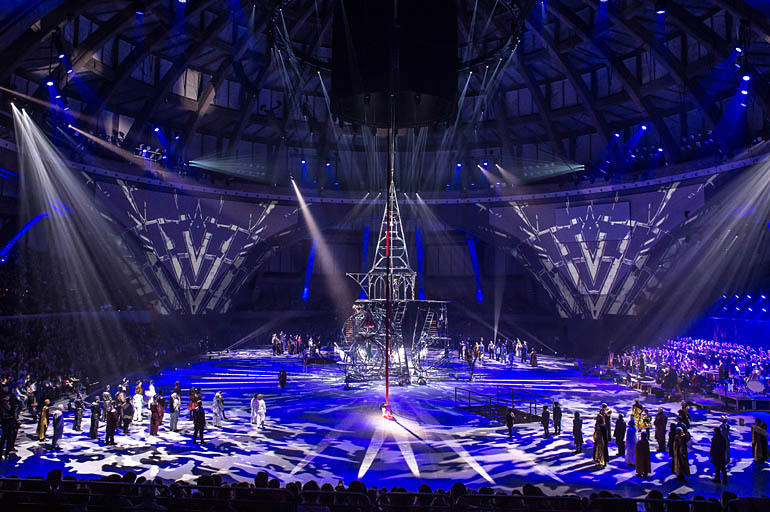 Many Polish cities competed for the title of the European Capital of Culture with their cultural offer, and Gdańsk, Katowice, Lublin and Warszawa all fought in the finals. 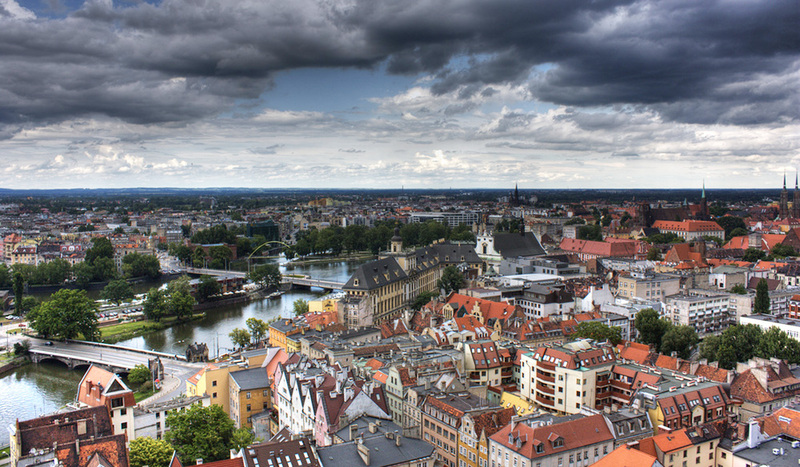 But it was Wrocław which won – recent years had seen many cultural events organised there to prove its potential. Architecture was a very important element of the programme. Unexpectedly, one of the key events was the construction of a housing estate. Nowe Żerniki, in the west suburbs of the city, is to be a model realisation of an estate that’s both friendly to its inhabitants as well as the environment. Nowe Żerniki is untypical from the urban point of view – its construction is the result of a collaboration between Wrocław’s city council, the Lower Silesian District Chamber of Architects of the Republic of Poland, and the Wrocław district of the Society of Architects of Republic of Poland/SARP. Over 40 architects participated in designing Nowe Żerniki. One of the masterminds of Nowe Żerniki, Zbigniew Maćków was also a curator of the architectural programme for the European Capital of Culture 2016. It involved promoting outstanding buildings from the past (for example, the WuWa neighbourhood, which helped inspire Nowe Żerniki) and highlighted the value of new but underestimated edifices (such as a renovation design by Jadwiga Grabowska-Hawrylak near Grunwaldzki Square aiming to restore some former glory). Several dozen exhibitions and shows took place, a few books were published (including biographies about Jadwiga Grabowska-Hawrylak, and Krystyna and Marian Barski). They stimulated discussion about architecture as well: for the competition to design a church in Nowe Żerniki, a book was published about post-war sacral buildings, accompanied by a debate about the quality of contemporary sacral buildings. ‘The European Capital of Culture awakened our appetite for architecture,’ summed up Zbigniew Maćków. In summer 2016, the Local File of Historical Monuments was enlarged to 90 objects. Most of them were built after World War II – protection for them is an unprecedented event, since some people find it difficult to think of post-war architecture as historical monument. Meanwhile, Warsaw’s Monument Conservator in collaboration with Warsaw’s department of the Society of Architects of the Republic of Poland/SARP tried to prove that after 1945, not only Warsaw but also other Polish cities were home to many artistically, functionally or technically interesting buildings that were special or original, and that they were worth not only our interest but also our protection. The defenders of post-war architecture in Kraków also succeeded. Hotel Cracovia, one of the most interesting examples of modernist architecture in the city was due to be demolished by a developer, but instead was recently added to the city’s list of protected buildings. It means that the building will be probably renewed and adjusted to new functions but maintain its original structure. Thanks to the authors of the book Architektura VII Dnia (editor’s translation: Seventh Day Architecture), we know that from 1945 almost four thousand churches have been built in Poland. Not many recently though: the boom for sacral buildings came to an end in the 1990s, when previously started buildings were finally finished. Nowadays, not many churches are built but some of the ones that have appeared have been showered with attention. In 2016, two temples, described a long time before their appearance, were put into service. One was the Church of Mary, Star of the New Evangelisation and St. Johnn Paul II in Toruń, and the other The Temple of Divine Providence in Warsaw. Both buildings have been criticised from an architectural point of view: not only were they considered too big and expensive, but most of all not modern enough. Reactionary in style, overwhelming, and without delicacy were some of the comments levelled at both, with the Toruń church additionally called kitsch, and the Warsaw temple chastised for inaccessible and coarse grandiosity. So is contemporary sacral Polish architecture a bit unlucky when it comes to successful realisations? This was the starting point for the organisers of a competition to design a church in the Nowe Żerniki model neighbourhood in Wrocław. Much attention was paid in the competition rules to the expectation that the building be simple and modest, available and friendly, and that it connected the qualities of sacral spaces with a meeting place that could build local community. As a result, not many of the historical or kitscher forms seen more commonly were found among the applications for the competition. But will Wrocław’s appeal for simplicity and modernity have a long-term effect in sacral architecture? Only the future can tell. It’s hard to imagine but only a few years ago, river quays in Polish cities were mostly inaccessible, unkempt, and generally daunting to walk or spend time around. This has changed rapidly – thanks to grassroots initiatives and city investments, riverside boulevards and beaches have started to come alive. In 2016, another city was enriched with an elegant walking route by the river with the revitalisation of Wrocław’s boulevards. Unlike, for instance, Warsaw, where development are usually far from the river, Wrocław’s numerous riverside walks create a special opportunity to admire architectural creations from different centuries – from classic, through modern, to contemporary buildings. Wrocław’s riversides have a specific, very urban character. Meanwhile, walking along the river in Warsaw looks completely different – it leads far away from the urban buildings, giving amblers the chance to admire the half-wild, green banks of the Wisła river. Almost every city with a river going through it now has some sort of adjoining walking or recreational areas (particularly in summer, like in Warsaw where the river heaves with partygoers). It has happened even in a place where there is no river. In Katowice’s Market Square, to coincide with a general renovation of the area, an artificial river was created temporarily (the area once crossed the River Rawa, but it was later built-up and hidden beneath asphalt and concrete). How needed rivers are in cities, and that it’s worth returning cities to natural water reservoirs, was proven by the popularity of the artificial Rawa in Katowice’s square – its riverbanks were simply crowded throughout the summer. Last year, we became used to the fact that every minute in a different city, another big, interesting and important architectural object was being created. These times are passing (due to the fact that money from the European Union have reached its limit). It doesn’t mean that attention-worthy buildings won’t still come into existence. In 2017, a few new public building are going to open their doors and surely we will all get to discuss them soon. The Museum of the Second World War in Gdańsk will soon finally open, a building made of red concrete with a slightly inclined tower as an identification sign (on top will be a coffeehouse with a beautiful view of the city). Political debates about the final shape of the museum’s exposition still continue but it has no influence on the dynamic silhouette of the building designed by Kwadrat Architects. Conspicuous building continue to appear in Poznań: next year, construction of the Bałtyk office building situated near the gate of the Poznań International Fair will supposedly be finished. The irregular silhouette of this 65-metre-tall building was prepared by Dutch group MVRDV, which is famous for its original ideas and is a candidate for this year’s edition of the Pritzker Award. The office building, other than its effective shape, is distinctive thanks to the very attractive public space around it. Supposedly opening in 2017, the Museum of Warsaw is likely to be completely different. It’s not in a new location – the line of tenements in Warsaw’s Old Town Square was occupied long ago by the Historical Museum of the City of Warsaw. Much like its name, the exposition presented inside wasn’t very interesting. A few years ago, the museum began a metamorphosis. Although it didn’t change venue, it looks completely different now. The insides were rearranged, thanks to which the architectural details have been exposed, with a complete rearrangement of its exhibits – soon a glass roof will appear over the museum’s court too (UNESCO had to give building permission for this element because Warsaw’s Old Town is on UNESCO’s World Heritage List). The Museum of Warsaw in its new embodiment will tell the story of Warsaw’s past in a more interesting way and with beautiful insides. Originally written in Polish, 22 Dec 2016, translated by BR, 29 Dec 2016.